"To everything there is a season..." and right now, that season is hot! So far in 2018, we have only had one 90+ day, but we have had plenty of 88-89F days, 17 in June alone. As of 2 July, this year  we are currently on track to have our hottest year in the vineyard since I began tracking it in 2009. New plugs for old blue! It has been pretty wet too; as of the end of June, we have had 34.24" of rain, or about 150% of what we would call 'normal' for this time of year. Hot and wet means the vines are experiencing some crazy growth. It is nearly impossible to keep up and manage the vegetation, but we do not give up easily. In my last post, we were worried about that late spring frost. We did not avoid the frost, but we did avoid most of the damage that it could have brought. We saw a few burned leaves, but that was about it. It was not a significant issue, so we were fortunate to have skated by mostly unscathed. I think the thing about which I am most excited in this growing up phase is our people. We have a fantastic team in place, a really strong team of folks. Arianna, Shruthi, Griffin, and Terri make Addison Farms Vineyard a better place every single day. Whether they are engaging our guests in the tasting room, talking to our retail partners, working in the vines or the cellar, or building our presence in the virtual or real world, we are better because of them. And Cindy, Justin, Bill, Gary, and Brian are helping with the never-ending work that comes from a vineyard. We have a new winemaker, beginning with the 2018 crush. Shruthi Dhoopati is now responsible for managing the vineyard and making the wine. She completed her masters degree in viticulture from Montpellier SupAgro in 2017. Shruthi is already making a big impact in the vineyard, and I am excited to learn from her as we take our winemaking to the next level. To me, that is the most important thing: We never stop trying to be better. We have been growing and learning on our own over the past ten seasons in the vineyard and eight seasons in the cellar. With Shruthi as part of the family, we accelerate learning, and we get better and stronger. Like Shruthi said, "We are always looking for ways to improve and refine, so the job is never done." Eddie and I have been doing even more work on the barns on the farm. 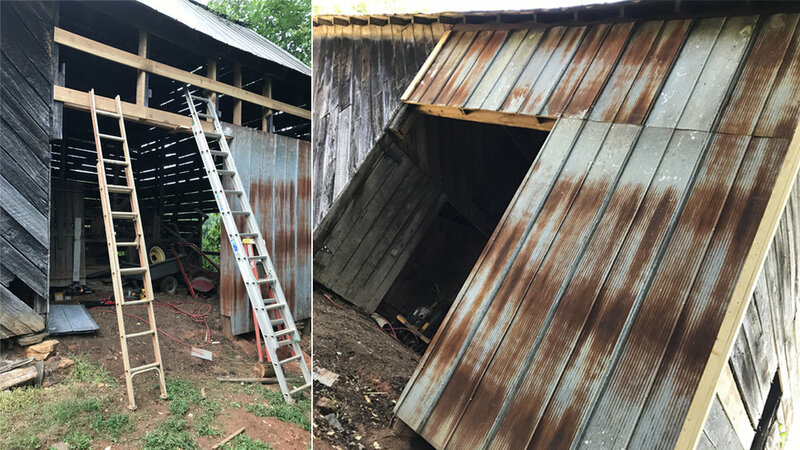 Our most recent project opened the side wall of a barn shed that was previously only accessible through the barn, which meant that we really could not use it for much. We took a bit of old tin that came from another farm on a barn tear-down that Eddie helped with nearly 50 years ago. The metal itself is likely 100 year old or more, and we have given it a new purpose on a barn of similar age. We also repaired a damaged hay shed [an errant 800+ pound roll of hay can do some damage!] to get ready for the first cutting of hay this year. If you haven't seen our fairly new YouTube channel, check it out. We are doing more and more video posts on Instagram as well, and we would love to have you follow us there. And while we love having your virtual attention, we still love it even more when you visit us on the farm. Tasting room hours are posted here.